West Side Story is a 1961 American musical-romantic drama film directed by Robert Wise and Jerome Robbins. The film is an adaptation of the 1957 Broadway musical of the same name, which in turn was inspired by William Shakespeare's play Romeo and Juliet. It stars Natalie Wood, Richard Beymer, Russ Tamblyn, Rita Moreno, and George Chakiris, and was photographed by Daniel L. Fapp, A.S.C., in Super Panavision 70. Released on October 18, 1961 through United Artists, the film received high praise from critics and the public, and became the second highest grossing film of the year in the United States. The film was nominated for 11 Academy Awards and won 10, including Best Picture (as well as a special award for Robbins), becoming the record holder for the most wins for a movie musical. On the West Side in the summer of 1957, there is tension between the Jets, led by Riff, and the Sharks, led by Bernardo. Lieutenant Schrank and Officer Krupke break up a brawl ("Prologue"), warning both gangs to stop fighting or they will be arrested. Despite the warning, the Jets challenge the Sharks to a rumble for neighborhood control. Riff decides that his best friend, Tony (co-founder of the Jets) should fight ("Jet Song"). He invites him to a dance, but Tony is uninterested and tells Riff that he senses something important will happen ("Something's Coming"). Eventually, Tony agrees to come out of loyalty to Riff. Bernardo's younger sister, Maria, tells her best friend Anita how excited she is about the dance. The gangs and girls refuse to intermingle at the dance ("Dance at the Gym"), despite attempts by a social worker. Tony arrives, he and Maria fall in love, and Bernardo tells him to stay away from her. Riff proposes a war council with Bernardo at Doc's drugstore, and Tony leaves the dance thinking about his new love ("Maria"). Anita tells Bernardo that he is overprotective of Maria, and they join the rest of the Sharks on the roof of their apartment building to compare Puerto Rico to the United States ("America"). The Sharks leave, and the girls go to bed. Tony visits Maria on her fire escape, and they reaffirm their love ("Tonight"). The Jets wait for the Sharks outside Doc's drugstore and are visited by Krupke, who warns them not to cause trouble. After he leaves, the Jets lampoon him ("Gee, Officer Krupke!"). The Sharks arrive, and the war council begins. They agree to a showdown the following evening under the highway, with a fistfight between Bernardo and Ice. Tony tells Doc about his love for Maria. The next day at the bridal shop, Maria tells her friends how wonderful it is to be in love ("I Feel Pretty"). After closing, Anita mentions the rumble to Maria. Tony arrives; Anita is shocked, and warns them of the consequences if Bernardo learns about their relationship. Maria tells Tony that she has heard about the rumble, and makes him promise to stop it. Tony gives his word, and he and Maria imagine their wedding ("One Hand, One Heart"). The Jets and Sharks prepare for the rumble, Anita prepares for her evening with Bernardo, Tony finishes work at Doc's and Maria awaits her evening with Tony ("Quintet"). The gangs arrive, and the fistfight begins. Tony tries to stop the fight, but Bernardo and the Sharks taunt him. Riff hits Bernardo, and the gang leaders draw their switchblades ("The Rumble"). Tony is restrained by Ice and Tiger; Riff is stabbed by Bernardo, who is horrified. An enraged Tony grabs Riff's knife and kills Bernardo, triggering a melee. Police car spotlights illuminate the scene and everyone but Tony flees. Anybodys (a tomboy who wants to be a Jet) shows up, grabs the knives, and she and Tony flee. Maria is waiting for Tony on the roof of her apartment building when Chino tells her what happened. Tony arrives, and asks her forgiveness before turning himself in to the police. Maria tells him not to, and reaffirms her love ("Somewhere"). The Jets reassemble in an alley. Action wants to avenge Riff's death, but Ice tells them how to deal with the police ("Cool"). Anybodys warns them that Chino is after Tony with a gun, and Ice sends the Jets to warn him. Tony and Maria are sleeping when a teary Anita brings Bernardo's jacket. Tony tells Maria to meet him at Doc's store so they can elope. Anita chides Maria for their relationship ("A Boy Like That"), but Maria convinces her to help them elope ("I Have a Love"). Schrank questions Maria about the rumble, and has Anita go to Doc's to tell him that she will meet him as soon as possible. The Jets do not believe that she is trying to help Tony, and harass her before she can deliver Maria's message. Anita says that Bernardo was right about them, and tells them that Chino killed Maria to avenge her romance with Tony. Doc throws the Jets out of the drugstore, and, in innocence, delivers Anita's false message to Tony. Tony runs into the street, shouting to Chino to kill him as well. He sees Maria, and they run toward each other; Chino steps out of the shadows and shoots Tony. The Jets, Sharks and Doc find Maria holding Tony, who dies as they reaffirm their love ("Somewhere (Reprise)"). Maria stops the gangs from fighting again, taking the gun from Chino and blaming everyone for Tony, Bernardo, and Riff's deaths before she collapses in tears. She kisses Tony; three Jets pick him up, and two Sharks help. The stunned members of both gangs disperse, leaving Chino to be led away by the police. Natalie Wood as Maria Nunez, Bernardo's younger sister, Chino's arranged fiancée, who falls in love with Tony. Richard Beymer as Tony Wyzek, co-founder of the Jets but has outgrown their street culture. Remains best friend of Riff, works at Doc's drug store, and becomes Maria's star-crossed lover. Russ Tamblyn as Riff Lorton, leader of the Jets, best friend of Tony. George Chakiris as Bernardo Nunez, leader of the Sharks, older brother of Maria and Anita's man. Ned Glass as Doc, drugstore owner, Tony's boss. A decent, elderly man. William Bramley as Officer Krupke, neighborhood cop and Schrank's sergeant. Penny Santon as Madam Lucia, owner of neighborhood bridal shop where Maria works. Tucker Smith as Ice, Riff's lieutenant, later becomes leader of the Jets since Riff's death. Eliot Feld as Baby John, the youngest member of the Jets. A relative innocent. Veteran director Robert Wise was chosen to direct and produce because of his experience with urban New York dramas such as Odds Against Tomorrow (1959). 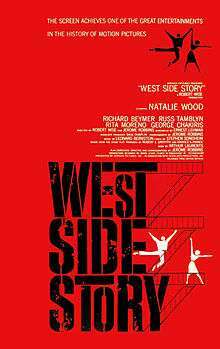 Since he had no experience directing a musical, Wise agreed that Jerome Robbins, who had directed the stage version of West Side Story, would direct the musical and dance sequences. After about one-third of the movie had been shot, the Mirisch Company, concerned that the production was running over-budget, dismissed Robbins. According to Saul Chaplin, Robbins nearly suffered a nervous breakdown during the time he worked on the film. The remaining dance numbers were directed with the help of Robbins' assistants. Recognizing Robbins' considerable creative contribution to the film, Wise agreed that Robbins should be given co-directing credit, even though Wise directed the greater part of the film. The ending title sequence was created by Saul Bass, who is also credited as "visual consultant" on the film. Because the producers wanted actors who looked believable as teenagers, they did not consider 30-year-old Larry Kert, the first Tony on Broadway, or 29-year-old Carol Lawrence, the first Maria, but some had experience in stage productions. Tony Mordente, who played A-Rab on stage, was cast as Action in the film, and George Chakiris, Riff in the London stage production, played Bernardo in the film. Tucker Smith, who joined the Broadway production several months into its run, played Ice, a role created for the film. David Winters, the first stage Baby John, played A-Rab, Eliot Feld, an ensemble member and understudy for Baby John on Broadway, played Baby John. Jay Norman, Juano on stage, appeared as Pepe. Reprising their stage roles in the film were Carole D'Andrea as Velma, Tommy Abott as Gee-Tar, and William Bramley as Officer Krupke. Elvis Presley was approached for Tony, but his manager, Colonel Tom Parker, strongly believed the role to be wrong for Elvis and made him decline in favor of other movie musicals. According to legend, the Colonel didn't want Elvis associated with gang warfare and knife crime, although three years earlier, Elvis' character Danny Fisher stabbed and killed the small-time gangster 'Shark' played by Vic Morrow in the movie King Creole. When the movie became a hit and earned 10 Oscars, Elvis regretted having given up the part. Others who auditioned for the part included Warren Beatty, Tab Hunter, Anthony Perkins, Russ Tamblyn, Burt Reynolds, Troy Donahue, Bobby Darin, Richard Chamberlain, Dennis Hopper, and Gary Lockwood. Bobby Darin made a strong impression on the producers at his audition and was, at one point, in talks for the role. However, he turned it down due to his concert and recording commitments. Tab Hunter, then 30, and Burt Reynolds, nearly 26, were also considered, due to their Broadway and singing credits, but they were dismissed because of their age. Richard Chamberlain was also thought too old at age 26. The producers settled on their "final five": Warren Beatty, Anthony Perkins, Russ Tamblyn, Troy Donahue, and Richard Beymer. Although he was 28 before filming began, Perkins' boyish looks and Broadway resume seemed to make him a contender for the role, and he was trying to avoid getting typecast after the success of Psycho. Robert Wise originally chose Beatty for the role, figuring that youth was more important than experience. Ultimately, Beymer, the most unlikely of the candidates, won the part of Tony. Tamblyn, after several callbacks, impressed the producers and was given the role of Riff. Natalie Wood was filming Splendor in the Grass with Warren Beatty and was romantically involved with him off-screen. The producers were considering her for the role of Maria. When Beatty went to screen test for the role of Tony, Wood read opposite him as Maria as a favor because she had been practicing with him. The producers fell in love with the idea of Wood as Maria but did not cast Beatty. Jill St. John, Audrey Hepburn, Diane Baker, Valerie Harper, Elizabeth Ashley, and Suzanne Pleshette were among the many actresses who lobbied for the role of Maria in the film. However, Hepburn later withdrew because she became pregnant. It is Baby John who is attacked and has his ear stabbed by Sharks. In the stage show, it's A-Rab. David Winters played Baby John on stage and he played A-Rab in the film. Both times he avoided getting attacked by Bernardo. Ice is a newly created Jet for the film. His name is Diesel onstage. Tonight takes place immediately after the dance in the stage show. In the film it was moved to after America. The Sharks sing America along with the Shark Girls in the film, while it's only the Shark Girls on stage. Anita and Rosalia sing it on stage, while Bernardo takes Rosalia's place in the film. Therefore, the majority of the song's lyrics are changed in the film. In the film Gee, Officer Krupke takes place before Cool and is sung by Riff instead of Action, and Cool is sung by Ice. On stage the songs are reversed. Cool comes first and sung by Riff. Gee, Officer Krupke is sung by Action. During the Quintet, Riff sings to Tony. In the film, he sings to Ice. On stage Diesel faces Bernardo during the rumble. In the film, Ice faces him. On stage, Action takes over as leader when Riff is killed. In the film, Ice takes over. In both versions, Anybodys falls in love with the new leaders after she is accepted. On stage, Velma is Riff's girl and Graziella is Diesel's girl. In the film, the girls' boyfriends are reversed. Graziella is Riff's girl. Velma is Ice's girl. West Side Story holds a 94% "fresh" rating on Rotten Tomatoes based on 62 reviews for an average rating of 8.3; the consensus states: "Buoyed by Robert Wise's dazzling direction, Leonard Bernstein's score, and Stephen Sondheim's lyrics, West Side Story remains perhaps the most iconic of all the Shakespeare adaptations to visit the big screen." The film earned $19,645,000 in North American rentals. Because of profit participation, United Artists earned a profit of $2.5 million on the film. The film has been deemed "culturally significant" by the United States Library of Congress and was selected for the National Film Registry in 1997. Its ten Academy Awards make it the musical film with the most Academy wins, including Best Picture. Three other films (Ben-Hur, Titanic and The Lord of the Rings: The Return of the King) won 11 Oscars, but none was a musical. The film's cast appeared and was honored at the 50th anniversary of West Side Story at the 2011 Ventura Film Festival. Leonard Bernstein was displeased with the orchestrations for the movie, which was the work of Sid Ramin and Irwin Kostal, who had orchestrated the original Broadway production. That show had been orchestrated for roughly 30 musicians; for the movie, United Artists allowed them triple that, including six saxophone parts, eight trumpets, five pianos and five xylophones. Bernstein found it "overbearing and lacking in texture and subtlety." Stephen Sondheim, who did not like the arrangement of the songs in the Broadway version, had the song "Gee, Officer Krupke" being sung before the Rumble in place of the song "Cool" which is sung instead after the Rumble; the song "I Feel Pretty" is also sung before the Rumble instead of after. In addition, the song "America" was sung in-between the two love songs "Maria" and Tonight", instead of having the two love songs being sung consecutively. The "Somewhere" Ballet was omitted, because it slowed down the pace of the film, and was sung instead by Tony and Maria. Reprises of the lyrics were omitted as well, especially in the songs "One Hand, One Heart" and "A Boy Like That". Some lyrics were changed in order to avoid censorship, especially in the songs "Jet Song," "Gee, Officer Krupke", "America" and the "Tonight Quintet." Even the phrase "Womb to Tomb, Sperm to Worm" between Riff and Tony had to be replaced with "Womb to Tomb, Birth to Earth" between Riff and Tony near the beginning of the film and "One-Two-Three, One-Two-Three" between Riff and Diesel in the Quintet. As provided in her contract, Wood prerecorded her songs and allowed the production team to decide whether to use her voice or not. She found the songs challenging, but was allowed to film her scenes lip-synching to her own vocals and was led to believe that these versions would be used, although music supervisors Saul Chaplin and Johnny Green had already decided to use Marni Nixon's voice. Wood's singing voice is only heard during the reprise of the song "Somewhere" when Tony dies. Though Nixon had recorded the songs in the same orchestra sessions as Wood, she had to re-record them to synch with Wood's filmed performances. Even the one song for which Wood had lip-synched to Nixon's voice, "One Hand, One Heart", had to be recorded again because Wood's lip-synching was unsatisfactory. When Marni Nixon learned that she had not signed a contract for participating in the recording and demanded a percentage of the LP record, she was told that all percentages had been allocated. Bernstein gave her 0.25% of his album royalties. This set a precedent for all future "ghost singers". Beymer's vocals were performed by Jimmy Bryant. Tucker Smith, who played Ice, dubbed the singing voice of Riff in "Jet Song", instead of Russ Tamblyn. Tamblyn's own voice was used in "Gee, Officer Krupke" and the "Quintet". Rita Moreno was dubbed by Betty Wand in the song "A Boy Like That" because the song needed to be performed at a register that was too low for her. However, Moreno sang her own vocals in "America". Marni Nixon sang some of Moreno's parts in the "Quintet" when illness prevented Moreno from doing so. Wand was also ill on the day of final recording, and so Nixon recorded Anita's vocal line as well. For the 50th anniversary of the film's 1961 release, a score closer to the Broadway version was created by Garth Edwin Sunderland of the Leonard Bernstein Office to be performed live at screenings of the movie with the score removed, but with the original vocals maintained. The score's New York City premiere was presented at Lincoln Center's Avery Fisher Hall, built atop the original film locations, which were razed in a late 1950s urban renewal project. The Stan Kenton Orchestra recorded Kenton's West Side Story, an entire album of Johnny Richards' jazz orchestrations based on the Bernstein scores in 1961. It was previewed at Capitol Records by the producers of the motion picture during the editing and mix down who lamented that, had they known of its existence, it would have been used as the musical foundation of the new film. The Kenton version won the 1962 Grammy Award for Best Jazz Recording by a Large Group. A still picture from the movie is the front cover of the Kenton LP. Director Steven Spielberg has expressed interest in directing a remake of the film. In 2000, West Side Story was remade in Bollywood as Josh, starring Shah Rukh Khan and Aishwarya Rai. In 2009, photographer Mark Seliger re-created scenes from the film for magazine Vanity Fair called West Side Story Revisited, using Camilla Belle as Maria, Ben Barnes as Tony, Jennifer Lopez as Anita, Rodrigo Santoro as Bernardo and Chris Evans as Riff. Portraying the Sharks are Minka Kelly, Jay Hernandez, Natalie Martinez, Brandon T. Jackson and Melonie Diaz. Portraying the Jets are Ashley Tisdale, Sean Faris, Robert Pattinson, Cam Gigandet, Trilby Glover, Brittany Snow and Drake Bell. ↑ "West Side Story (AA)". British Board of Film Classification. January 12, 1962. Retrieved June 19, 2013. ↑ "David Winters Tribute Site". Davidwinters.net. 2003-04-01. Retrieved 2012-03-14. ↑ Berson, Misha (2011). Something's Coming, Something Good: West Side Story and the American Imagination. Applause Theatre & Cinema Books. p. 155. ↑ Grant, Barry Keith (2012). The Hollywood Film Musical. Wiley-Blackwell. p. 100. ↑ "West Side Story (1961) – Awards". The New York Times. Retrieved December 24, 2008. ↑ "The 34th Academy Awards (1962) Nominees and Winners". oscars.org. Retrieved 2011-08-22. ↑ Berson, Misha (2011). Something's Coming, Something Good: West Side Story and the American Imagination. Applause. ↑ Nixon, Marni (2006). I Could Have Sung All Night: My Story. Billboard Books. pp. 132ff. ↑ Nemiroff, Perri (2014-08-08). "WEST SIDE STORY Remake is Still on Steven Spielberg's Mind". The Collider. Retrieved 2016-06-01. ↑ Seliger, Mark (March 17, 2009). "West Side Story Revisited". Vanity Fair. Retrieved July 18, 2010.